5086 ✉ \"K. D. Fieldpost station office TAKU / South fort\" and single circle postmark \"K. D. FIELD postal service station No. 4 24.11. 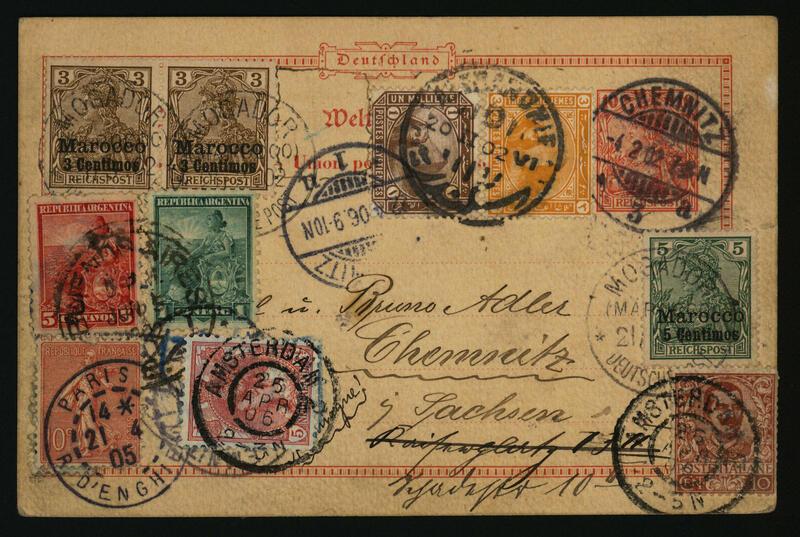 (1900) \", always twice neat on very nice fieldpost card, commercially used to to browse with arrival postmark. 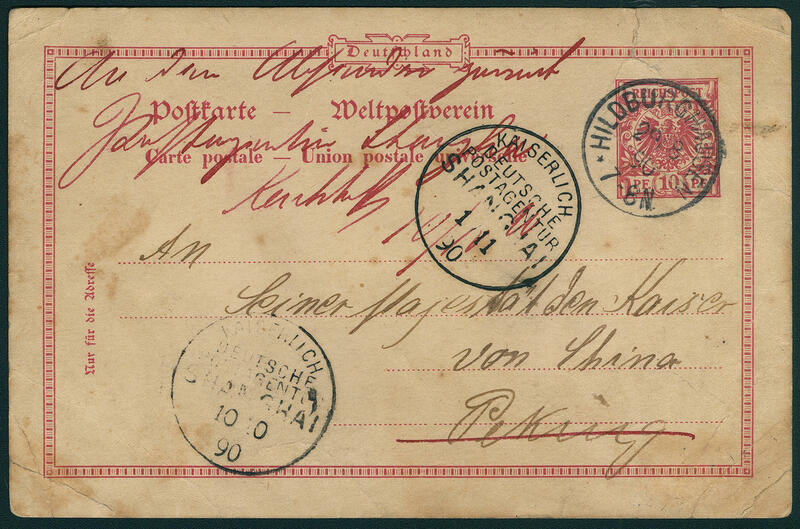 The fieldpost cancel from Taku / South fort count commercially used to the large rarities of the German post in China. There are only few copy from this known. Photo expertize \"faultless condition\" Jäschke-Lantelme BPP. 5087 ✉ \"TIENTSIN German post 26.9.16. 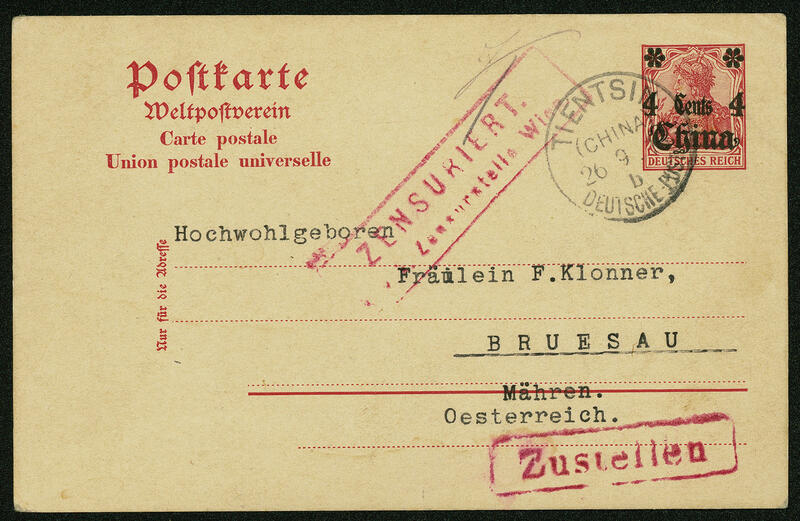 \" clear on postal stationery 4 C., clean commercially used with additional red censorship stamp \"censored K. And K. Censor office Vienna\" and rectangle cancel \"deliver\" in red, with interesting text over the aid programme for German and Austrian Hungarian prisoner in Siberia. 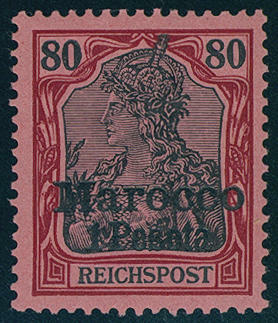 A war mails rarity and associated with Austrian censorship stamp a rarity of this area! 5088 ✉ \"TSCHIFU German post 6.8.15. 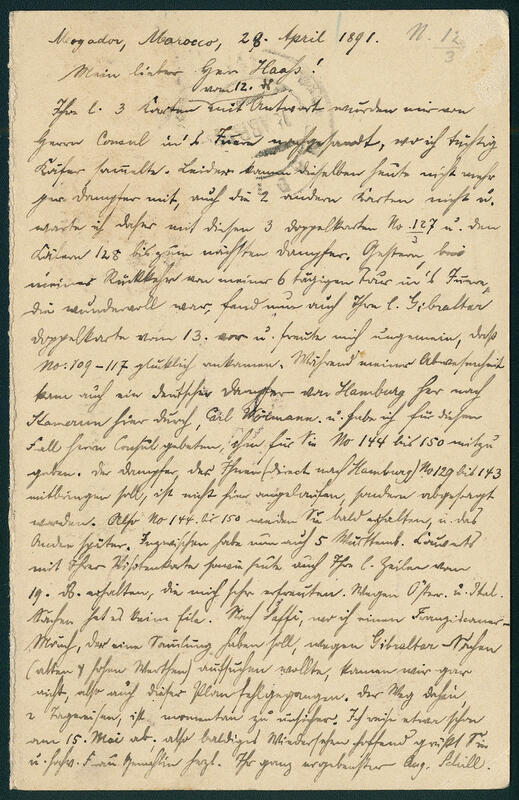 \", clear on postal stationery 4 cents on 10 Pfg., in perfect condition and commercially transported with a lot of text and clear censorship stamp \"FRANKFURT (MAIN) supervision place of the XVIII. Army corps\" in violet to Vienna. The card was over the USA and seeming Scandinavia or Holland to Germany transported. A particularly beautiful card from the second war year! 5089 ✉ Postcard to the Emperor from CHINA: 10 Pfg. Crown / eagle, postal stationery postcard with clear single circle postmark \"HILDBURGHAUSEN 29.8.90. \" with interesting text and receiving addres \"at his majesty the Emperor from CHINA Beijing\" with transit cancellation \"imperial German postal service agency SHANGHAI 10.10.90. 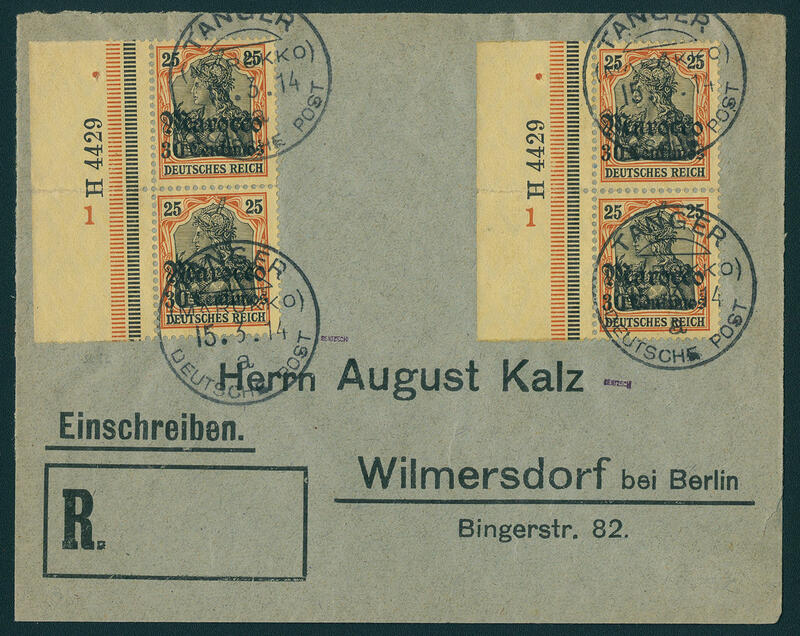 \", again return used with front- and on the back single circle postmark \"imperial German postal service agency SHANGHAI 1.1.90. \". In spite of tear and an additional traces of usage a very interesting and extraordinary document! 5090 ✉ DR46b 5 Pfg. Crown / eagle on postal stationery Gibraltar 1/2 P. With handwritten notation \"reply\" with duplex stamp \"TANGIER 31. AU. 92. 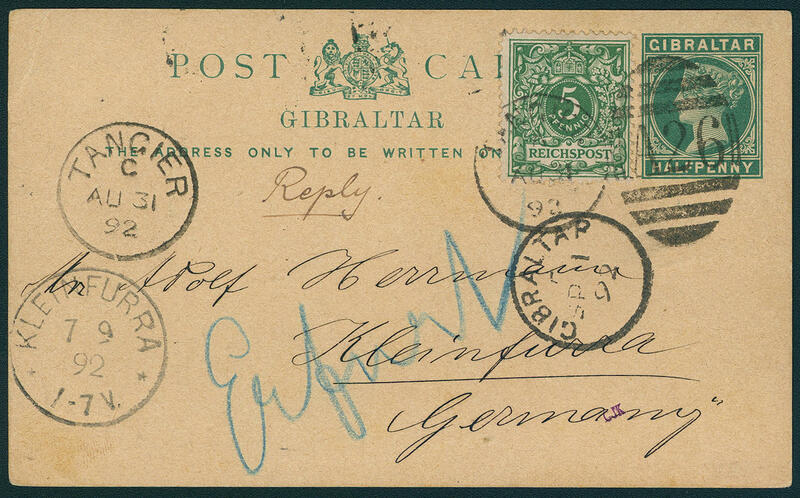 \" with German text and transit cancellation \"GIBRALTAR 1. September 92. \" and on the back transit cancellation \"MADRID 4. SET. 92. 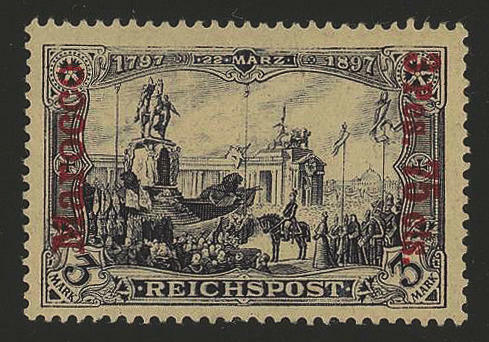 \" to Kleinfurra with arrival postmark and forwarded to Erford. 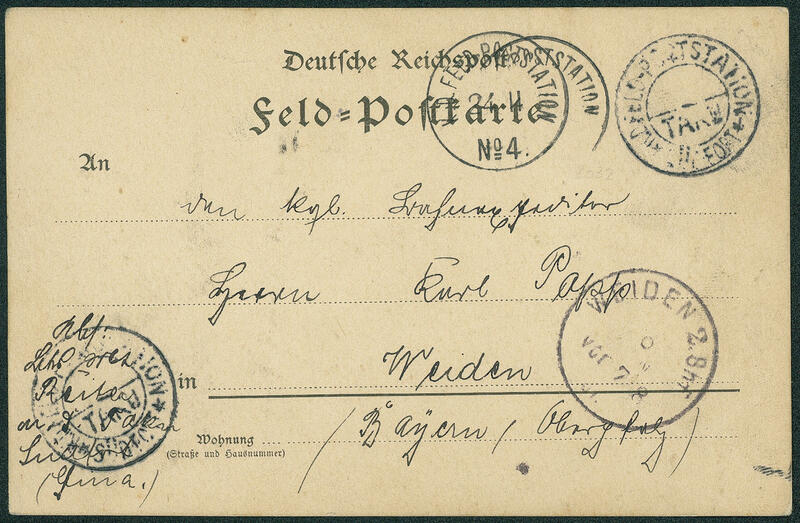 An extraordinary precursor card before establishment of the German postal service institutes! 5091 ✉ DR47d 10 Pfg. Crown / eagle, fresh colors and in perfect condition as a single franking on wrapper with clear rectangle cancel \"from West Africa\" and handwritten posting \"MOGADOR 5.12.90. 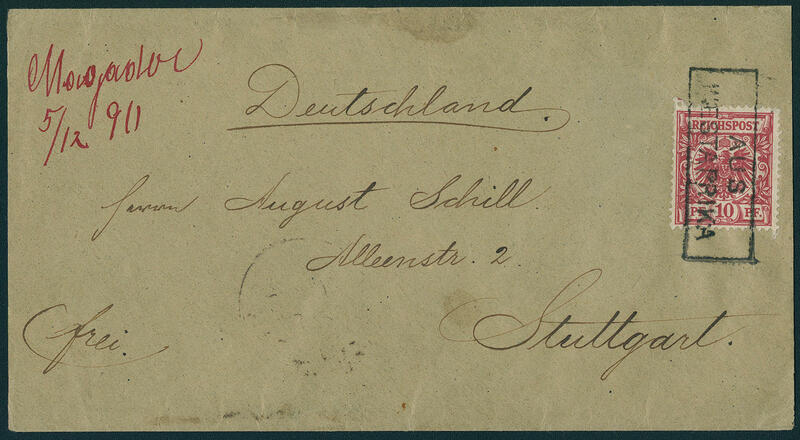 \" to Stuttgart with arrival postmark. 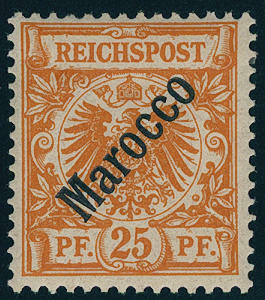 A very nice and rare shipÂ´s mail forerunner from Morocco! 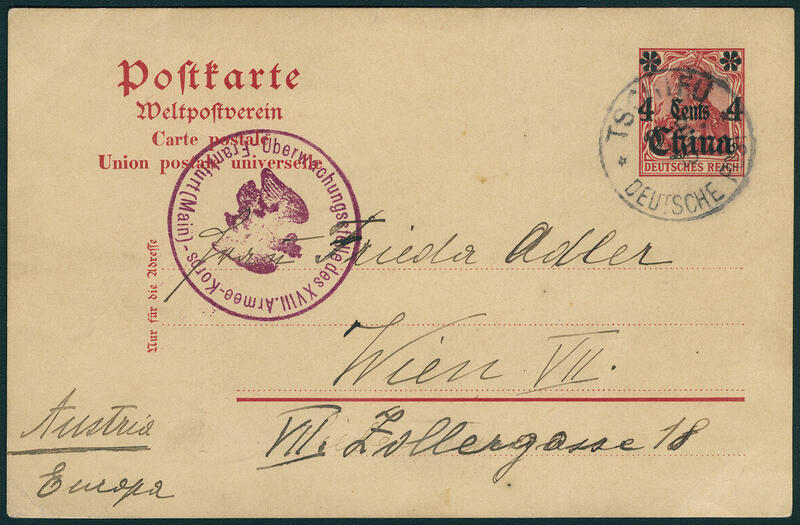 5106 ✉ Wuerttemberg, 5 Pfg., double postal stationery from \"STUTTGART 12. April 91\" with additional franking 3 Pfg. (2) to Mogador with detailed text and the answer part again return transported to Stuttgart with additional franking Gibraltar Cts. Very decorative and rare! 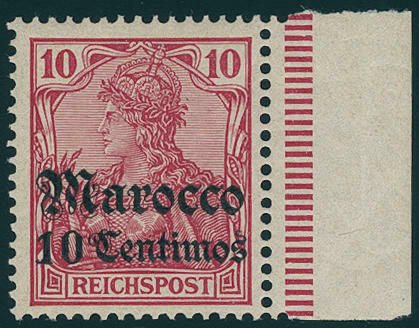 5092 I/VI Postal stamps 1899, the not issued set with overprint \"MAROCCO\", all six values fresh colors and in perfect condition unused with original gumming and neat trace of a hinge. Michel 1000,- €. 5093 ✉ 7,8I 3 Cts. On 3 Pfg. In the pair, 5 Cts. On 5 Pfg. On card with seven countries franking, mailed in \"CHEMNITZ 4.2.02\" and there again arrived with arrival postmark \"CHEMNITZ 22.4.06\", well, over four years later. Obviously has a collector his journey round the world documented and the card at different Post offices in Egypt, Italy, Argentina, Morocco, France and Netherlands cancel let. Italy franking to the margin fixed. An extremely decorative and in this kind all extraordinary piece, which through the obviously private-transportation exceptional attractive is! 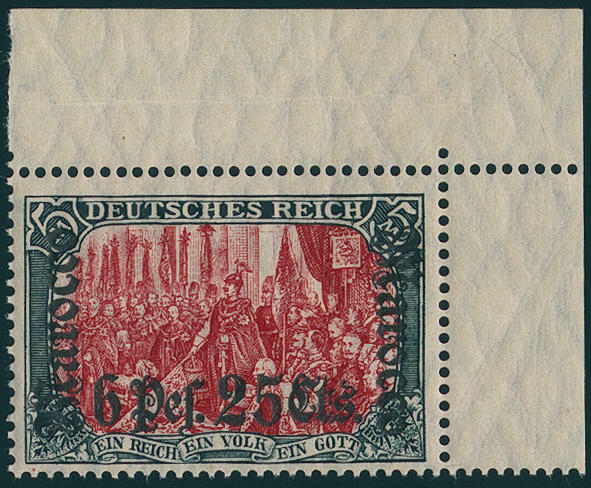 5094 7/15II The not issued Germania set, all eight values wonderful fresh colors and well perforated, in perfect condition unused with original gumming. A very scarce issue. The edition amounted to be on only 46 sets! Photo expertize \"faultless condition\" Jäschke-Lantelme BPP. Michel 3000,- €. 5095 13PFXIII 50 Cts. On 40 Pfg. 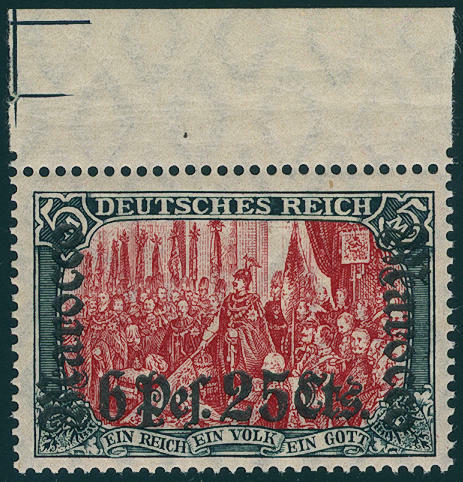 Reichspost with scarce plate flaw \"thickly white dot over meander lower right\" in perfect condition mint never hinged, without any signs. Michel 350,- €. 5096 18II/II 3 Pes. 75 Cts. On 3 Mk. Violet black, the scarce thickly overprint in the good type II, fresh colors and very well perforated, in perfect condition mint never hinged a hardly ever offered issue! Photo expertize \"qualitatively complete flawless\" Dr. Steuer. 5097 VII 10 C. On 10 Pfg. 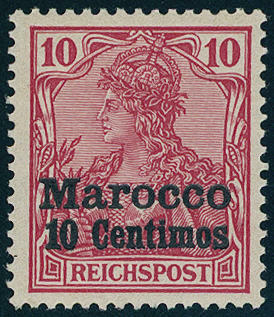 Dark reddish carmine, fresh colors and very well perforated, in perfect condition mint never hinged from right margin of sheet, in utterly perfect condition, without any signs. These stamp arrived not to the issue. 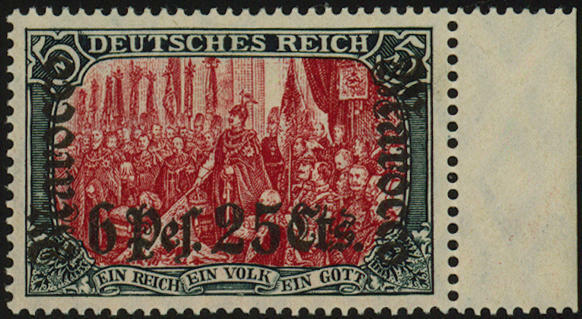 It was only a sheet to 100 pieces in the year 1923 of the Reich postal administration auctioned. A piece of dream this rarity for the highest standards! Photo expertize \"faultless mint never hinged condition\" Jäschke-Lantelme BPP. Michel 3500,- €. 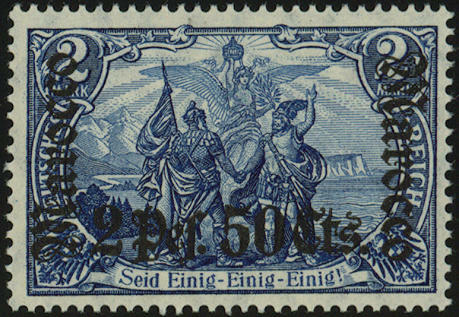 5098 34/45 Overprint set 1906, wonderful fresh colors, first-class perforated, in perfect condition mint never hinged without any signs. In this excellent quality extraordinarily rare. Photo expertize Jäschke-Lantelme BPP. 5099 ✉ 38HAN 30 C. On 25 Pfg. 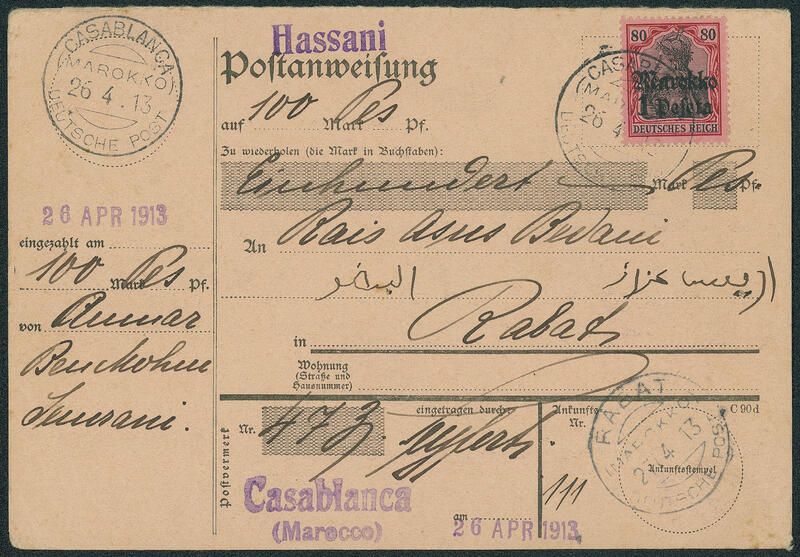 Watermarked, two vertical pairs from left margin of sheet, prefolded, both with house order number \"H4429\" on philatelic registered cover from \"Tangier (Morocco 15.3.14. ) 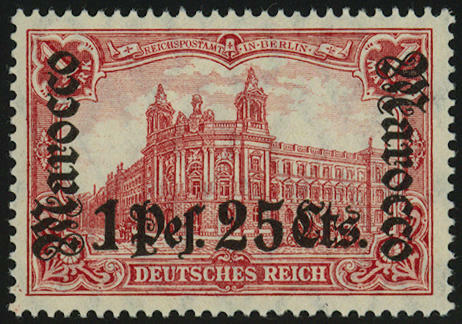 \" to Berlin addressed, without arrival postmark. 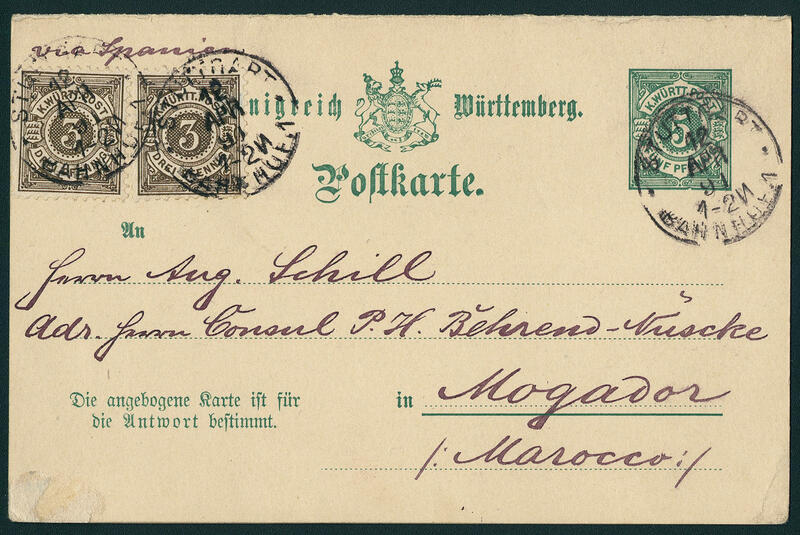 House order numbers of the German post in Morocco are already in normal form on covers extremely rare, as multiple franking a rarity! Signed Gentzsch. 5100 45 6 P. 25 C. On 5 Mk. 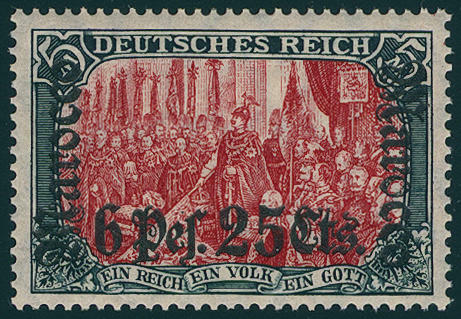 Green black / dark carmine, fresh colors and very well perforated from of the right upper corner of the sheet, unfolded and in perfect condition mint never hinged, without any signs. 5101 45 6 Pes. 25 Cts. 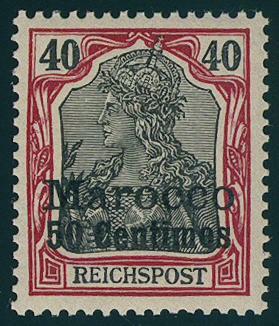 Green black / dark carmine, fresh colors and very well perforated from upper margin, unfolded, in perfect condition mint never hinged, without any signs. Michel 420,- €. 5102 45 6 Pes. 25 Cts. Green black / dark carmine, fresh colors and very well perforated, in perfect condition mint never hinged without any signs. Michel 420,- €. 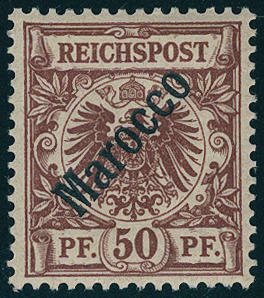 5103 ✉ 54 1 peseta on 80 Pfg., wonderful fresh colors and in perfect condition as extremely rare correctly franked single franking on complete money order in Hassani with neat postmark \"Casablanca German post 26.4.13\" to Rabat with arrival postmark. In this kind as a single franking and besides as complete money order (confirmation of payment was nearly always separated) extraordinarily rare! 5104 ✉ 55IA 1 Pes. 25 Cts. On 1 Mk., faultless single franking on nice international postal money order (Hassani) with postmark \"FES 20.7.14. 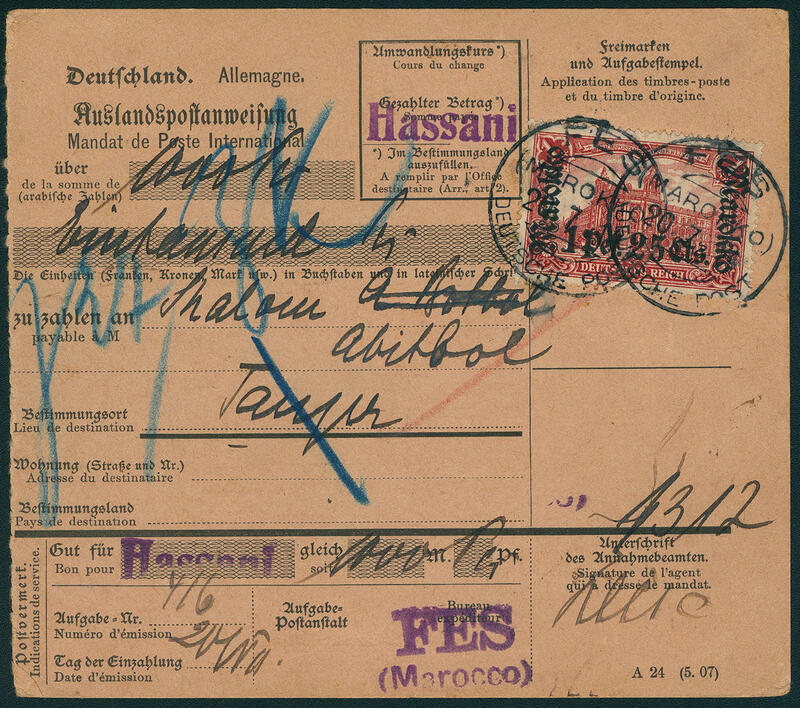 \" to Tangier with arrival postmark. Rare!